There is a place where water turns one of Earth’s harshest deserts into a Garden of Eden, brimming with an abundance and diversity of life found nowhere else in the world. This vast oasis is renewed each year by the ebb and flow of one of Africa’s greatest rivers, creating an astonishing wilderness that is home to all of Africa’s iconic animals where they are drawn into incredible concentrations by water’s life-giving force. This place is the Okavango Delta in Botswana. When most people think of a delta, they think of the Mississippi, the Nile, or the Rhine, great rivers that make their way to the sea to dump their silk laden waters. But, the Okavango River never reaches the sea. Instead, it dumps its waters into an ancient flood basin amidst the parched sands of the Kalahari Desert in Botswana. And the life-giving force it creates there is nothing short of miraculous. Its waters spread over an enormous area of the Kalahari, creating a vast system of channels, streams, and lagoons that cover some 16,000 square kilometers (9,900 square miles). This enormous inland delta is visible from space and is one of the largest wetland wildernesses in the world. As a result of its unique geology and biological significance, the Okavango Delta has been named one of the Seven Natural Wonders of Africa and is a UNESCO World Heritage site. It is also home to some of Africa’s most endangered large animals, including the cheetah, wild African painted dogs, white rhinoceros, black rhinoceros, and lion. The story of the Okavango begins high in the Angola highlands. Here, seasonal rains flow into the Okavango River. The river then travels over 1,700 kilometers (1,056 miles) to the southeast before dumping its waters into the Okavango Delta, transforming a section of the Kalahari Desert into an unlikely water world. The annual flood-tide, which pulses through the wetland system every year, revitalizes the ecosystem and is a critical life-force to the region’s wildlife. Additionally, the flood happens to arrive at the peak of Botswana’s dry season, making it into a venerable Eden for the region’s animals. During the Kalahari’s wet season (a generous designation considering it only receives 100 millimeters (4 inches) of rain every year), many of the region’s large mammals occupy the areas surrounding the delta, grazing on seasonal grasses and other plants. But, by mid-May, the seasonal rains have gone and the desert becomes all but uninhabitable. Then, like a biblical flood, water that began its journey eight months prior in the Angola Highlands finally reaches the delta. Starting out only as a small trickle, water slowly begins filling the ancient and enormous flood plain. With no rain in sight for months, the arrival of the annual flood-tide arrives like a miracle from heaven. As the waters rise and spread across the delta, streams, lagoons, and islands form. Giant mats of lilies and papyrus form along the edges of the water. Riding the front of the flood wave comes an army of fish, snapping up insects as their burrows and grassy homes are flooded out. And, with the fish comes enormous numbers of aquatic birds, congregating in huge numbers, hunting catfish, frogs, and bream. Great herds of elephants, cape buffalo, zebra, giraffe, and other herbivores, who just saw their grazing grounds in the Kalahari turn to dust, return to find the sweet, clear waters of the delta spreading out over a piece of land nearly three times the size of Delaware. And from the permanently wet heart of the Okavango come the delta’s architects. Massive and ornery, hippopotamus force their way through the lilies and papyrus, creating new pathways where the water can flow. As a result, life-giving water reaches parched ground where it otherwise would never have reached. This expands the delta and creates new streams and lagoons which in turn brings life-giving water to other plants and animals. As the waters spread across the flood plain, over 200,000 animals migrate to the delta, making it the site of one of the greatest concentrations of wildlife seen anywhere in the world. A myriad of species are found within the delta including African Bush Elephant, African Buffalo, Hippopotamus, Lechwe, Topi, Blue Wildebeest, Giraffe, Nile crocodile, Lion, Cheetah, Leopard, Brown Hyena, Spotted Hyena, Greater Kudu, Sable Antelope, Black Rhinoceros, White Rhinoceros, Plains Zebra, Warthog and Chacma Baboon. Notably, the endangered African Wild Dog still survives within the Okavango Delta and exhibits one of the richest pack densities in Africa. In addition to these, over 482 species of birds, 160 mammalian species, 155 types of reptile, and 35 amphibians call the Okavango Delta home during its annual deluge. Unlike many other parts of Africa, the Okavango Delta ecosystem exists in a nearly pristine state. The influence of humans is minimal in the delta, allowing visitors a chance to view an ecosystem that is as close to what the world looked like before man’s influence as we have on this planet. And, for Backcountry Journeys clients who travel to Botswana with us, it will be our goal to witness and photograph this natural wonder in all its splendor and majesty. As wildlife photographers, we make it our goal to observe and photograph natural scenes of the greatest beauty and rarity. And, within the Okavango, there are several such topics to focus on. One of the primary photographic subjects that we will seek will, of course, be Africa’s famous big cats, and the Okavango is home to all of them, including the cheetah, leopard, and lion. Interactions between big predators are common in the Okavango. With two species of hyena present on the Okavango, competition between hyenas and lions can be fierce. Lions, of course, have the upper hand in sheer strength and size, but the hyena has them outmatched in numbers and tenacity. Lions will hold onto a kill as long as possible. But, the scales of favor will begin to tip towards the hyenas as more and more of them arrive to harass and force the lions off of a kill. Often, antelope and other prey animals are chased into the shallow pools and lagoons of the Okavango by lions or wild dogs only to be snatched up by a waiting Nile crocodile. The big cats are wary of the water, and rightfully so. They know what dangers lie just below the water’s surface, and they approach to drink or cross with the utmost caution. Amongst the lion prides of the Okavango, there are several different hunting specialties and preferences. Some lion prides specialize in antelope, others in wildebeest and zebra, and others are experts in taking down the most dangerous prey a lion can hunt the African buffalo. Buffalo are widespread across Africa and are amongst the most dangerous animals on the African landscape. They are big and strong, and they know it. They have poor eyesight, but an incredible sense of smell. If you are ever upwind of a group of buffalo, they will smell you from hundreds of yards away and will stare you down as if you were standing right in front of them, a somewhat disconcerting situation if photographing them from an exposed position. 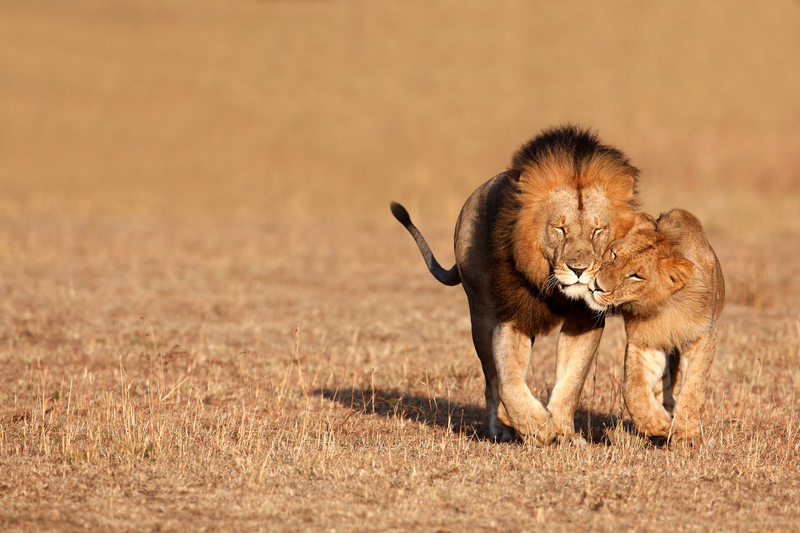 Lions are regularly killed or wounded in the pursuit of buffalo meat. And, it is because of this that lion prides that specialize in buffalo hunting have some of the most specialized skills compared to lions that seek less dangerous quarry. 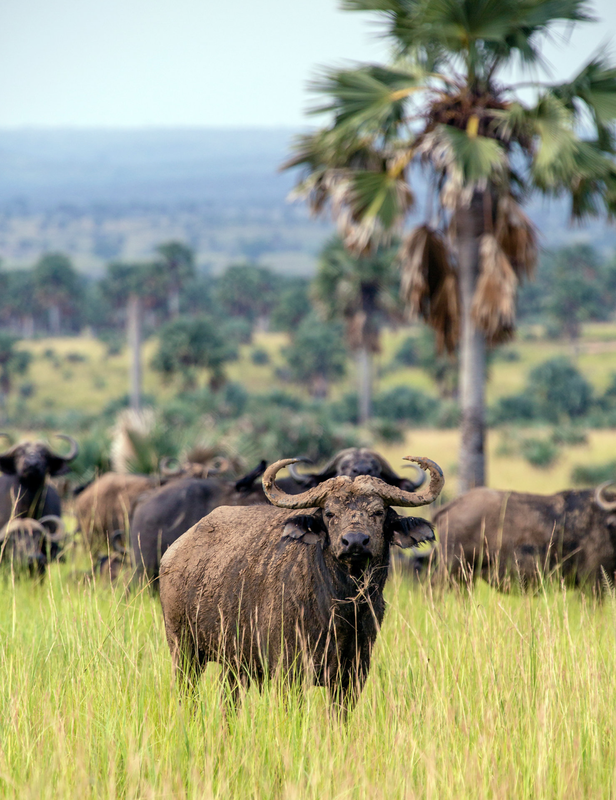 During times of plenty, when water flows with abundance and there is plenty of green grass to eat, buffalo will move in small groups of ten to twenty individuals. But, when resources become scarce during the harsh dry season, the smaller groups band together and form enormous super herds. When the Okavango Delta is in full flood, they can regularly be seen soaking in cool clear pools of water and munching on water lilies in apparent pure delight. Probably the most sought after cat by wildlife photographers in the African landscape is the leopard. This is also one of the most elusive of Africa’s cats and finding them can be a challenge. But, in the Okavango, their numbers are high and sightings are common. Often, it is with one’s nose that you can first detect the presence of a nearby leopard. They are extremely territorial and mark the borders of their territory with urine. So, it is that ammonia cat urine smell that so many domestic cat owners know and hate that will often alert you to the presence of a nearby leopard. Leopards are tree climbing experts and often ambush antelope from above, sitting silently in a tree waiting for its prey to wander obliviously beneath it. Another favorite prey of the leopard is the chacma baboon. Amongst the most widespread, and therefore evolutionarily successful of Africa’s primates, the chacma baboon is omnivorous, highly social, and very intelligent. They exhibit a wide variety of social behaviors, including a dominance hierarchy, collective foraging, adoption of young by females, and friendship pairings. But, don’t provoke the mob unless you’ve got the tools to defend yourself. Chacma baboons are amongst the largest monkeys in the world and possess four-inch canine teeth that they use in self-defense. Should a young cheetah or leopard try too brazenly to take on a group of baboons, or simply stray too close to the mob, the young cat can pay for it with their life. For me, one species that is an absolute favorite and on the top of my list of animals I want to photograph is the African wild dog (also known as the African painted wolf, or painted hunting dog). There is a common misconception, most likely due to its name, that the African wild dog is descended from the domestic dog. Amongst common folklore is that they are all descended from a common ancestor who escaped human captivity to reenter the wild. This, however, is not true. They are only distantly related to the domestic dog, and the African wild dog’s direct descendants have always been wild, going back over 200,000 years in the fossil record. For this reason, conservationist’s have proposed changing its name to African painted wolf, to improve human perception of this iconic African predator. The African wild dog is endangered due to habitat fragmentation, hunting by humans, and disease. But, the Okavango Delta is the wild dog’s last great stronghold. They exist here in stronger numbers and with healthier populations than anywhere else in Africa. There are many things that make the African wild dog unique amongst other canines, but it is their pack mentality and incredible hunting tactics that make them such a remarkable species to observe. For one, they are hypercarnivorous, meaning they only eat meat, unlike some other canines that will occasionally eat grasses or other plants. Its all about the pack with wild dogs and their hunting strategies are some of the most effective amongst African predators, and perhaps the most effective of its large predators. Once a chase ensues, the African wild dog’s kill rate is well over 85%! African wild dogs are also amongst the fastest of all mammals in Africa, only slightly slower than the cheetah, but with much greater endurance than the cats. They are antelope experts and have developed shrewd hunting techniques to bring down their quarry. They are excellent at flanking prey, setting up ambushes, and using their numbers to exhaust and corner their prey before bringing it down. Like many other canines, African wild dogs have a strict dominance hierarchy. Both the females and males compete independently for dominance, and it is only the dominant female and dominant male who will mate. Puppies begin learning hunting tactics at a young age. They are usually allowed to feed on carcasses before the adults, and at only a few months of age, are allowed to join hunts, but only as spectators at first. By the time they are large enough to assist in the hunt in earnest, they’ve already had months of watching the adults bring down prey. 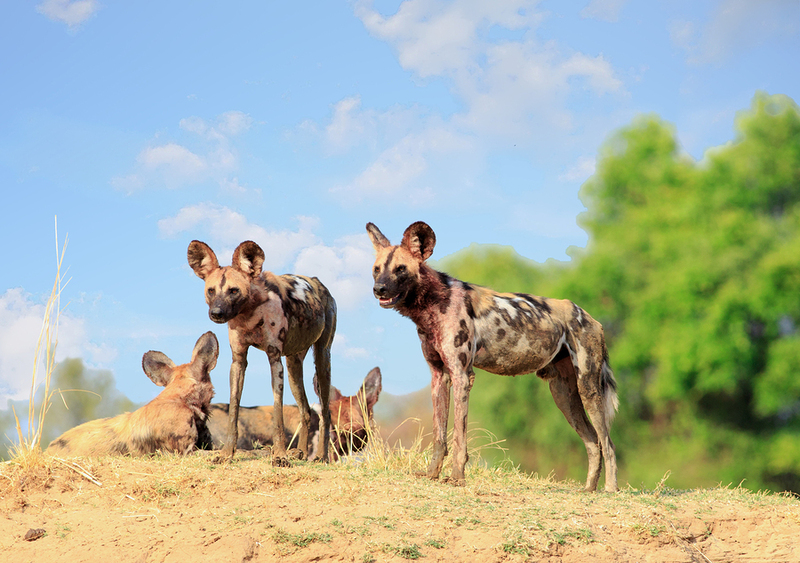 The tight family bonds of a pack of African wild dogs and their incredibly intelligent and efficient hunting techniques make them one of Africa’s most interesting large predators to observe and photograph, and nowhere else in Africa can they be found in such numbers as the Okavango Delta. Nowhere else in Africa will you find numbers of elephants like you will find in Botswana, especially in the Okavango. During the harsh dry season of the Kalahari, when the flood waters of the Okavango arrive to quench the parched land, thousands of elephants arrive in the delta, following ancient migration routes that predate the existence of man in the region. During the annual flood tide, the number of elephants in the delta can reach upwards of 100,000 individuals! Over a sixth of the world elephant population lives in Botswana, and few places offer a better opportunity to photograph the largest land mammal on earth up close. Adult bull elephants can reach weights of over five tons, and fueling such massive bodies takes an enormous amount of food, with adults consuming over 300 kilograms (660 pounds) of food daily. Elephants love soaking, swimming, and feeding in the freshwater lagoons of the Okavango. Elephants are also one of the few animals that can digest the tough papyrus that grows along the water’s edges, creating a maze of pathways and channels. And, yes, that is the same papyrus that was used by the ancient Egyptians to make paper. Along with hippos, elephants are some of the architects of the Okavango. They forge new pathways through thick papyrus and lily mats, fell trees, and allow water to move along new channels created by their hulking bodies. Herds of elephants usually consist of either all females, led by a matriarch or of a small group of male bachelors. Male and female elephants usually only intermingle during breeding. Due to Botswana’s strict anti-poaching enforcement, geographic isolation, and excellent habitat, it is one of the African elephant’s greatest refuges. 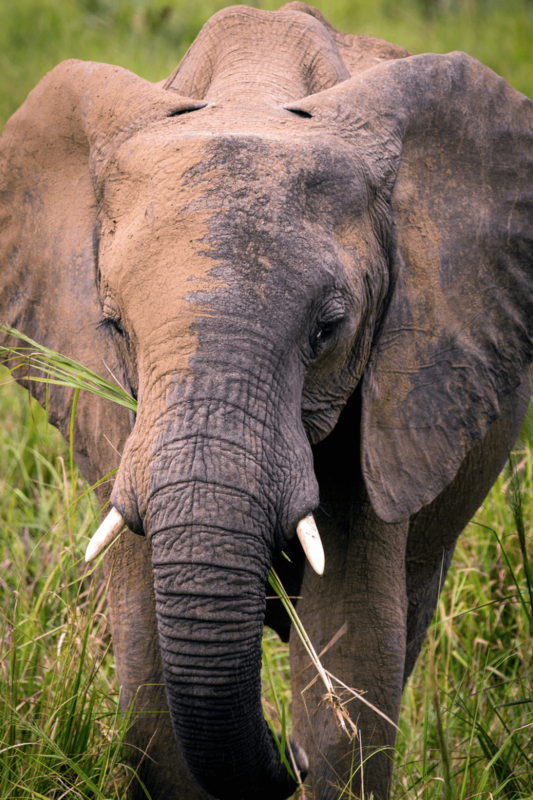 Elephants are regularly relocated here by conservationists from neighboring South Africa and Zimbabwe where poaching is a much greater threat. One of the best means of observing these majestic animals is by boat, and that is exactly what we will be doing on the Backcountry Journeys Botswana Safari. By moving along the waterways, we will be able to move far closer to these sometimes temperamental animals than we would if we were going by land. And, until you’ve been up close to an adult African elephant, comprehending their true size is impossible. While I was on safari in Uganda, a male bull elephant moved dangerously close to our safari vehicle, which was a 4×4 van, at least seven feet from ground to roof. And, this bull loomed over it nearly twice as tall as the vehicle. My driver and guide nearly had heart attacks as they thought the bull was gonna knock us off the road and into the lagoon next to the road. Thankfully, it chose not to do this, but only give us a passing glance and a light touch of its trunk as it stepped into the water and let us pass. These moments of adrenaline are what African safaris are all about if you ask me. Though all birders are not photographers and all wildlife photographers are not birders, we certainly can share a common love for the rare and beautiful birds of the African continent. And the Okavango Delta is home to 482 species of bird, including 33 species of water bird, making it a paradise for birders. The high density of birds in the region means that each bird species has evolved in highly specialized ways to avoid conflict over resources, causing some remarkable adaptations. A great example of this would be the aptly named African spoonbill. Their broad, flat beaks are ideally formed for snapping up unsuspecting prey in the shallows of the delta. The open-billed stork has an entirely different adaptation, with a beak that has a 6-millimeter gap in the center. This adaptation makes it ideal for grasping and opening aquatic snails and mussels. This adaptation makes the open billed stork so successful that it is one of the most common storks on the African continent. The black stork doesn’t have a specialized beak shape like its open-billed cousin but instead uses an elaborate technique for hunting small fish. It spreads its wings around its head, forming a half dome, umbrella shape that it holds just above the water’s edge. The reason it does this is still debatable. One theory is that it reduces glare on the water so it can more easily see its prey. Another theory is that the shade it creates entices small fish to swim underneath its wing umbrella for refuge only to be snapped up by the hungry stork. The black stork takes it one step further though by wiggling its brightly colored toes in the mud like a fishing lure to attract unsuspecting prey right under its waiting beak. A favorite family of birds for me in Africa are the hornbills. These bizarre and grumpy looking birds come in a wide array of shapes and colors, but all possess the bizarre looking large, downward curved beak. The red-billed hornbill is commonly sighted in the delta. These birds have a symbiotic relationship with the dwarf mongoose. As the mongoose digs for grubs and other insects underneath logs and rocks, the hornbill will station itself on the log and will sing out an alarm should any predator come into sight. In exchange for this security service, the mongoose allows the hornbill to feed upon any insects that are flushed into the air by the mongoose’s digging. Such a strange and seemingly intelligent symbiotic relationship is a treat to behold. 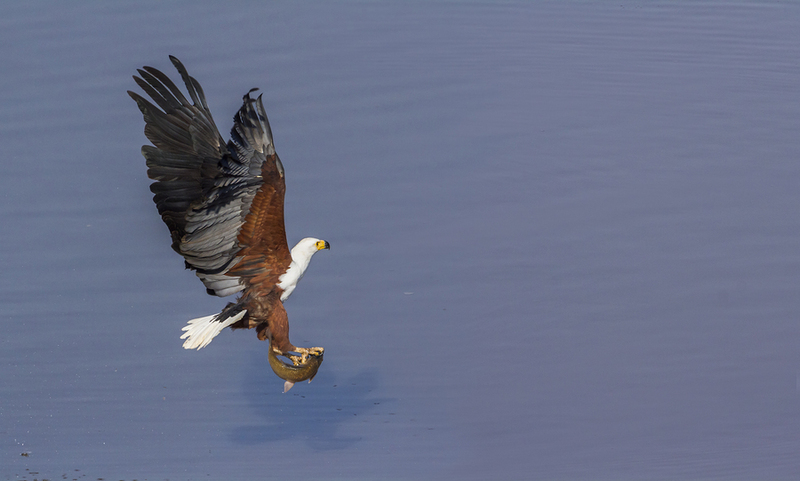 Another favorite for wildlife photographers is the majestic African fish eagle. This large raptor is related to the North American bald eagle, though it is a bit smaller in size. Their large brown bodies and stark white heads certainly look reminiscent of the bald eagle. And like the bald eagle, the African fish eagle is a precision hunter. It can often be spotted in treetops near lagoons and streams, scanning for fish that venture too far into the shallows. Once an attack is launched, the African fish eagle rarely misses. 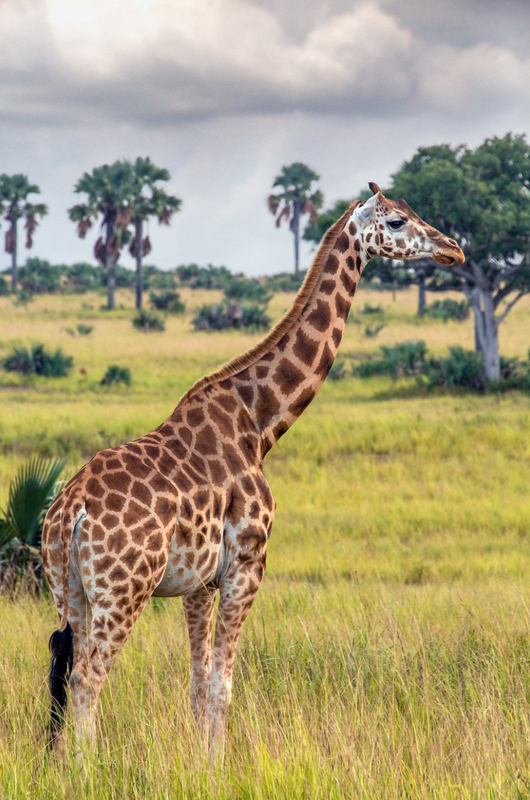 Amongst the most iconic of Africa’s wildlife, visitors to the Okavango will have the chance to observe great herds southern giraffe, zebra, wildebeest, rhinoceros, and antelope. And along the water’s edges, you will find enormous Nile crocodile sunning themselves or lying in the delta’s pools and streams waiting for an unsuspecting animal to venture too close. Great herds of hippos soak in the delta’s cool waters while marine birds use them as hunting platforms for frogs and small fish. All of Africa’s big predators call the Okavango home, as well as the greatest concentration of the continent’s giants, the African elephant. There is truly nowhere else in the world like Africa’s garden of Eden, a place that without the life-giving force of a river that never reaches the sea, would be a scorched and perilous desert. But, this remarkable natural phenomenon, over the millennia, has transformed an ancient desert into a shimmering paradise for the most iconic of Africa’s wildlife. Nowhere else in the world will you encounter such a wide array of wildlife and in such density as you will on the Okavango Delta. I, for one, could not be happier to see Botswana added to the list of destinations offered by us at Backcountry Journeys. It has long been my dream to visit the Okavango Delta and Chobe River of Botswana. When it comes to seeing and photographing Africa’s wildlife, there is no place better, no place more remarkable, and no place so unique as the Okavango Delta.